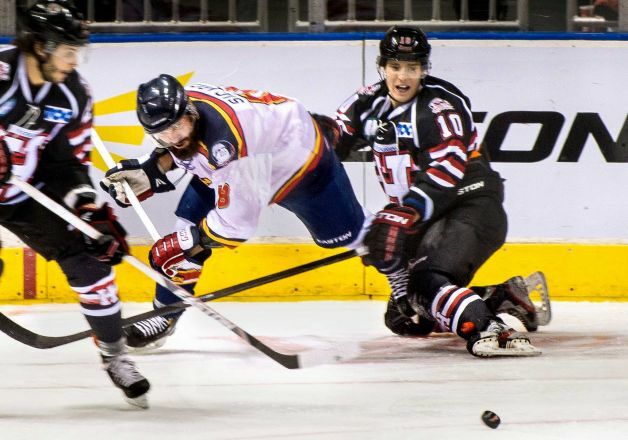 It was quick action by trainers from minor hockey league’s Peoria Rivermen and Huntsville Havoc’s teams that saved the life of Huntsville’s center Justin Cseter. According to the Peoria Star Journal, Riverman forward Dennis Sicard accidently fell on Cseter, causing a deep six inch gash in his unprotected leg. As blood spurted from the wound and pooled on the ice, a doctor called for a player to break a hockey stick in half to use as a tourniquet around his thigh while an EMT arrived with IV fluids. After a half hour, doctors finally wheeled Cseter off the ice to a round of applause from spectators and players. After 39 minutes the game was officially suspended and both teams came back on the ice, lined up on their respective bluelines and saluted the crowd. To crowd cheers, the teams formed a handshake line at center ice. Cseter was released from the hospital later that night, according to the team’s Facebook page and he boarded a bus for the nine-hour trip back to Huntsville. Never let it be said that hockey players aren’t a tough breed! Congratulations to everyone involved! It continues to show that an emergency really does bring out the best in people.